2. Locate the desired flag. From here, you can highlight the description, type in a new one, then click the Update button. You can also delete the flag by clicking the red Delete button, or make the flag Inactive by clicking the Inactive button. 3. From here, you can highlight the description, type in a new one, then click the Update button. You can also delete the flag by clicking the red Delete button, or make the flag Inactive by clicking the Inactive button. Modifying flags here will only impact the flags on the active property. 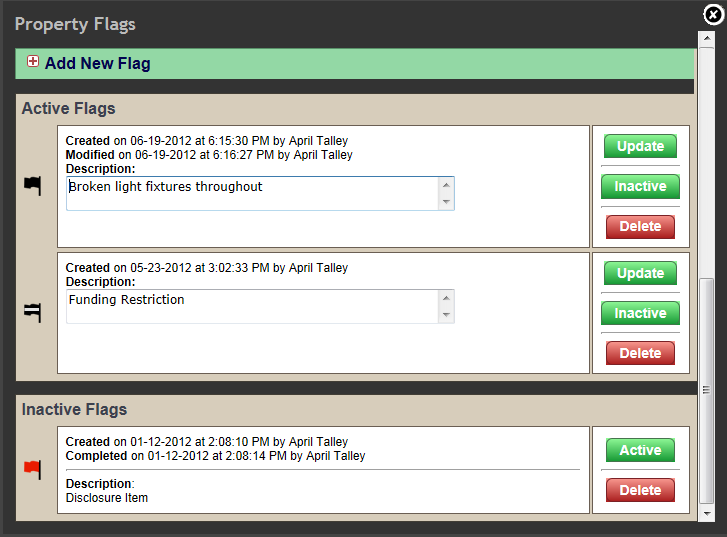 For information on modifying flags for all properties, click here. To activate an inactive flag, locate the flag in the Inactive Flags section and click the green Active button.